This GruyÃ¨re cheese potato bake is a company worthy potato dish that is ridiculously easy to make~no washing, peeling, or boiling potatoes required! 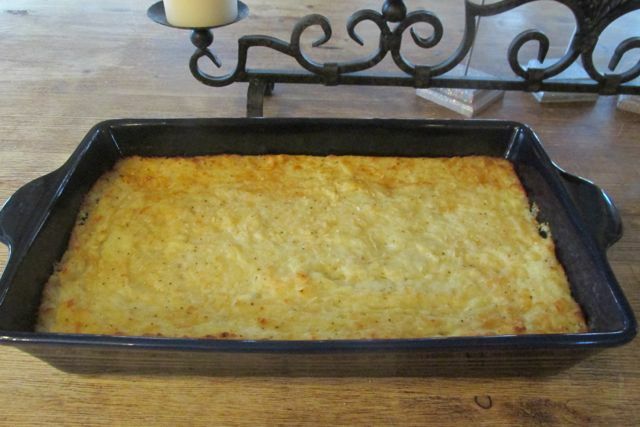 This GruyÃ¨re cheese potato bake is an easy “potato version” of one of my favorite side dishes~Gourmet GruyÃ¨re Cheese Grits. Since not everyone loves grits, I thought a potato version would be nice. I doubled the recipe below and took this to a holiday lunch, where it was a huge hit and a wonderful complement to the beef tenderloin. The key to the flavor of the dish lies in the GruyÃ¨re. This Swiss borne cheese lends a complex flavor (fruity, earthy & nutty) that can’t be found in any other cheese. A bit pricey, GruyÃ¨re averages $13.00 per pound. (For tips on choosing the best brand, see the information at the end of the post). The key to making this dish quickly and easily is using Ore-Idea Steam & Mash potatoes. The potatoes are grade A Russets that are peeled and ready to steam in the microwave. When these go on sale, I always stock up. They are in the freezer section of most grocery stores near the frozen French fries & tater tots. I would love to hear from you if you try these (or if you come up with your own savvy version of the recipe)! Thank you so much for taking time to visit my site. As always, be blessed, and stay savvy! Gruyere and parmesan cheese make this a company worthy potato dish that couldn't be easier to make. Spray baking dish with cooking spray; set aside. Microwave potatoes per package directions (9-10 minutes). Once done, place cooked potatoes in bowl; place butter on top to melt. Sprinkle potatoes with salt & pepper. Warm milk and half & half slightly in microwave; add to potatoes. With hand mixer, mix potatoes until just smooth, being careful not to over mix (lumps are fine). Spread potatoes evenly in baking dish. Top potatoes with parmesan & brush with melted butter. Bake at 350 degrees until golden on top. Choosing the best GruyÃ¨re: In Cook’s Illustrated taste tests, the following brands are recommended: Emmi Le GruyÃ¨re Reserve, GruyÃ¨re SalÃ©, GruyÃ¨re Alpage, and French GruyÃ¨re de ComtÃ©. Two “recommended with reservations” brands are Swiss Rose Le GruyÃ¨re, and Emmi Le GruyÃ¨re. Boar’s Head is NOT recommended. Since most of these brands are in a similar price range, a trip to Whole Foods or The Fresh Market for a recommended brand can make a huge difference in the quality of the cheese and outcome of the dish.